As in previous years we are organising once again a meeting for all PA46 enthusiasts and others who share our interest. 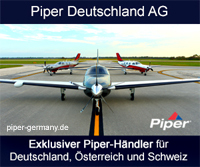 This event is being sponsored by Piloten-Service Rieger who are providing the location. Rieger experts will be available during the day to answer your questions and offer advice. In addition MT-Propeller Mühlbauer and Avionik Straubing have agreed to be there. There will be a wide range of news and facts, new accessories and equipment, demonstrations and practical advice. There will, of course, be food provided and there will be an impressive display of various PA46's, from the Malibu and Mirage to the turbines. If you would like to come please confirm your participation by 10th October 2002 at the latest. Please state your name, your postal address, type of plane and your callsign. We also need to know how many people you will be. We hope that most of you will be able to come and look forward to spending an interesting and pleasant day with you.